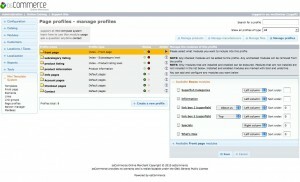 Page profiles is a system that let you organize your pages into groups and attach them to profiles. You can create in that way individual layouts for any page, doesn’t matter if it is a product, a category at any level, the front page or a information page. 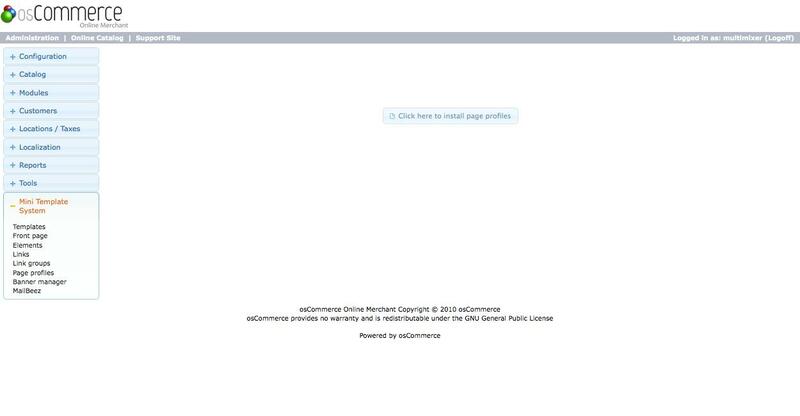 Seeing this page means that page profiles are correctly installed. Before going further, let’s take a minute to understand the concept. This will help you to understand and manage the whole system in a better way. Page profiles are a collection of settings regarding the display of various modules. 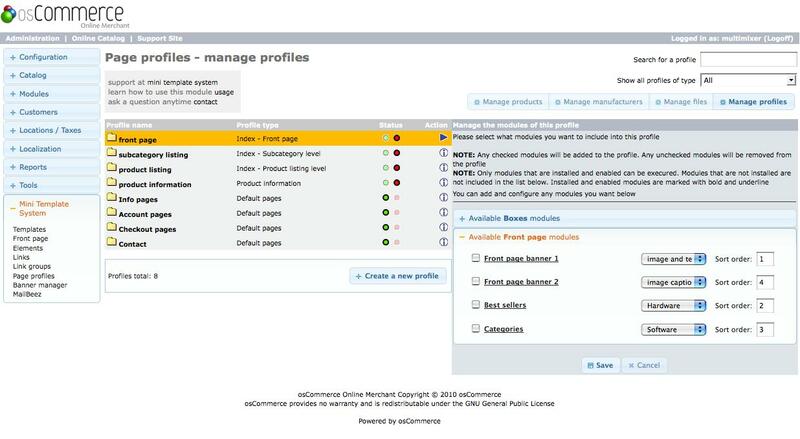 Not all modules are meant to be used on every page, so there are modules for the front page, modules for the product information pages, but also modules for all pages, like for example the boxes. 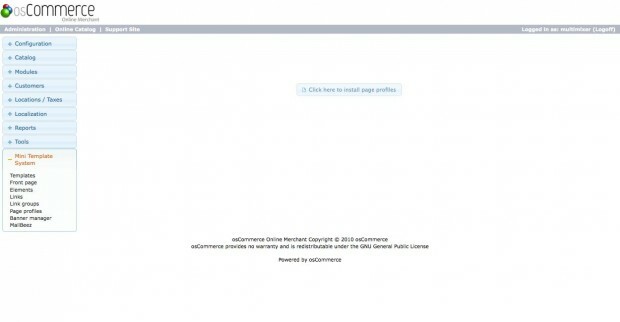 To create a new page profile, click on “create new profile” at the bottom of the page. To edit an existing one, you can select it from the list and then click “edit” on the right side. This is the part where you can do profile specific settings for any modules. 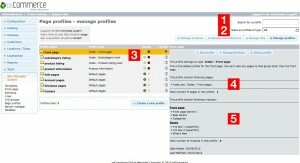 Depending on the profile type, you will get a list of all available modules for this profile type. 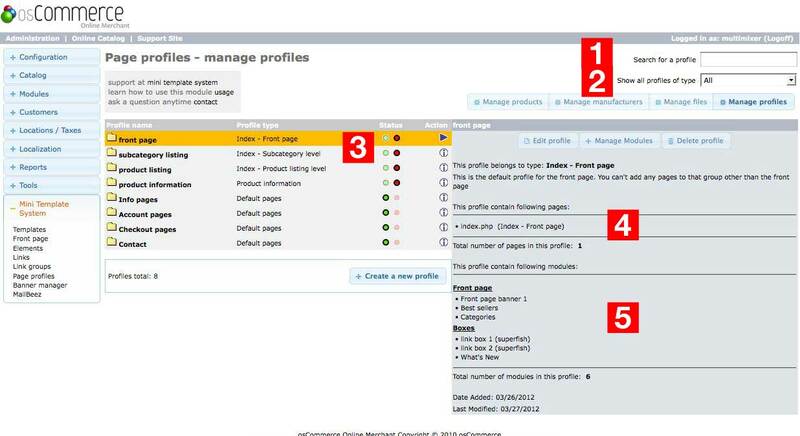 For example, if the profile you want to manage belong to type “front page”, you will get all general modules (like the boxes) and the special front page modules. If the case belong to type “product listing” you will get the special product listing modules and any other modules meant for product listing pages. Same you can do for any other module groups, like the front page modules. So you could set up 2 or 3 profiles for the front page, and use for profile A a banner slider with banner group 1, after that the main categories, and for profile B, the same banner slider but with a different baner group and the new products module just after. It is more than easy to attach then a profile to a page, this comes in the next chapter. To get to this area, please click on “manage files” at the top menu. First thing to do here, is to update the files list. To do so, click the “update files” button at the bottom of the page. 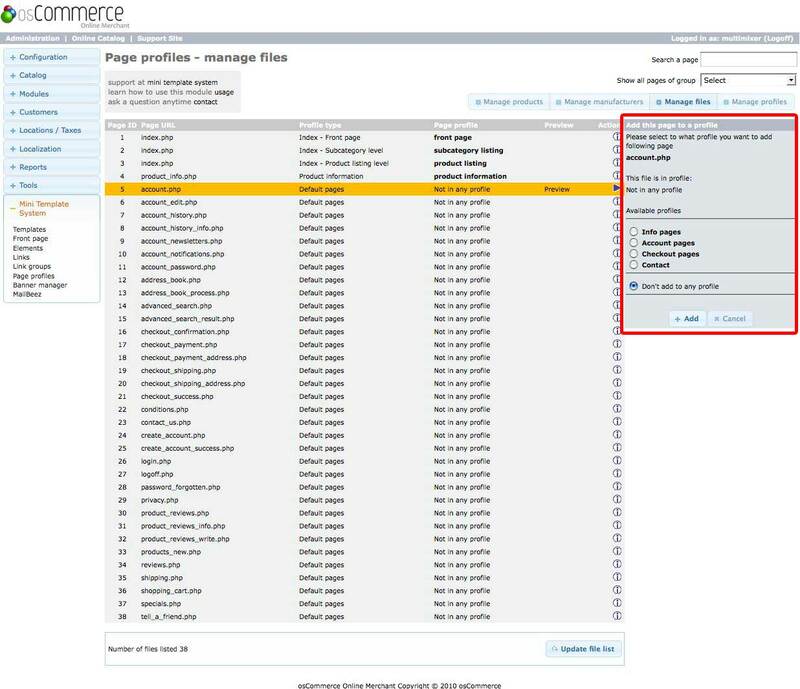 This will create a list of all files in your osCommerce installation. In case you delete any files from your installation at any time, please click the “update files” button again, to remove them from this list too. To attach a page to a profile is easy. Click on “add to profile” on the right side and select the profile you want to add this page too. Index – subcategory listing: That are the pages that list categories that have subcategories attached. You can attach profiles of this type only. The profile attached to this page, will affect all pages that list subcategories. 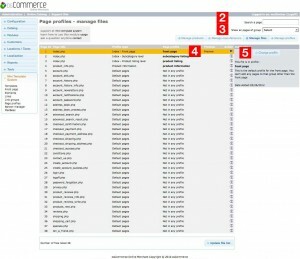 Index – product listing : That are the pages that list the products. You can attach profiles of this type only. 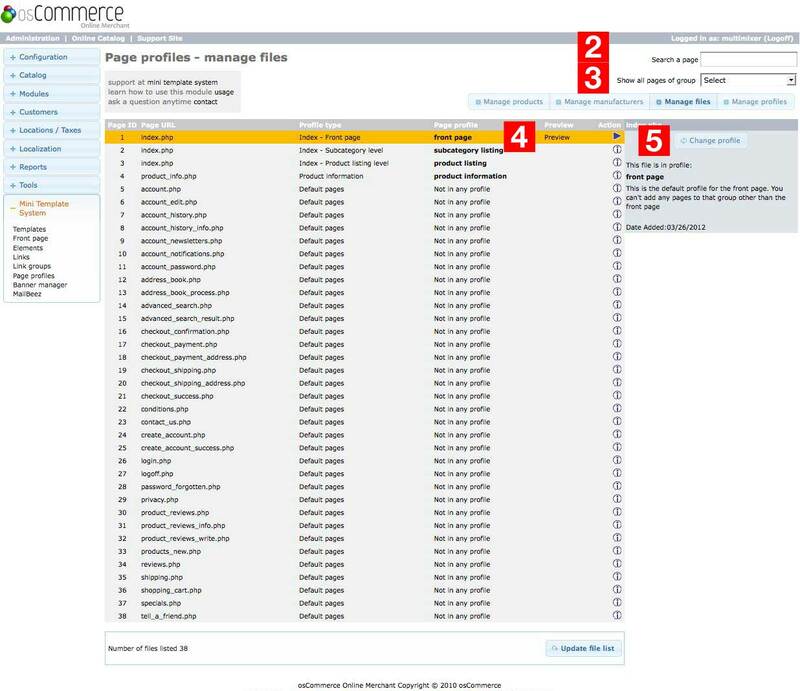 The profile attached to this page, will affect all pages that list products either of a specific category or of a manufacturer . 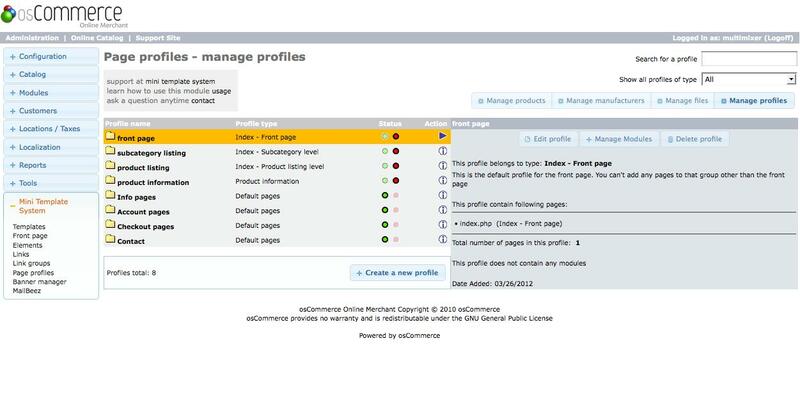 To get to this area, please click on “manage products” at the top menu. To attach a category to a profile is easy. Click on “add category to profile” on the right side and select the profile you want to add this page too. 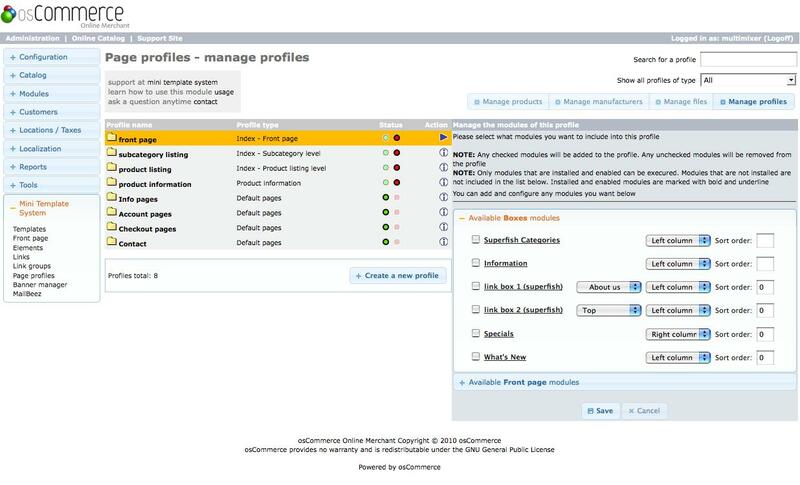 Important to keep in mind is that, when you add a category to a profile, the setting affect only the selected category, not any of its subcategories, while when adding all products of a category to a profile, this will affect all products of the selected category and of all subcategories. As mentioned before, any specific settings have priority over the general settings. Let’s say for example, you have product “printer” added to profile A. You have all products of category “printers” added to profile B. You have also all products of category “hardware” , to what the printer belong, added to profile C. Finally you have all product information pages attached to profile D.
How will the display be in this case? 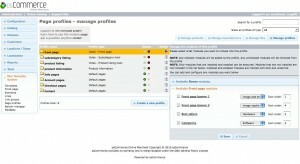 There is however the case that a specific category will change it’s “profile type”. This can happen in case you add some subcategories to a category that was previously listing products. Or in case you delete any subcategories of a category, letting it to display just products. 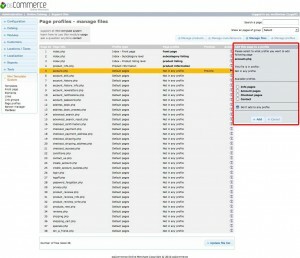 In this cases the type of the category and the page profiles entry do not match anymore. The category may have product listing modules attached, while it is in real a category that list subcategories. To get to this area, please click on “manage manufeacturers” at the top menu.